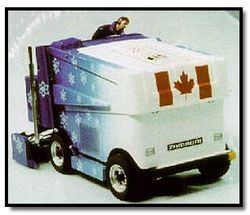 I always thought getting to drive the Zamboni would be fun.... The machines come in all sizes, and all sorts of custom paint jobs. And so, I end the ABC Along (about the only -along thing I've actually finished) on time, and with a cool word that has nothing to do with knitting, spinning, wool or even Maine where I live! I hope each of you has a very wonderful New Year celebration in your own flavor, and stay safe! Would expect anything less of me, since I spend extraordinary amounts of time seeking out exotic spinning fibers? 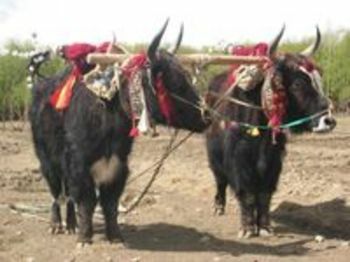 What alphabet would be complete without a "yak" in it? These in Tibet are decorated and honored by the families to which they belong. I know you won't believe I didn't make this one up, but I didn't. xeep - Sheep--a term used to describe someone who likes to follow and imitate others. e.g., Joe keeps doing the same things I'm doing and buying the same clothes. What a xeep! If you are a Doubting Thomas, or from Missouri, here is the reference to the Pseudodictionary . As soon as I saw it, I thought we fiber folks had to hold a special place for this word! While I have done way too much shopping for my kids et al this past month (or more), I have done some shopping for myself as well. 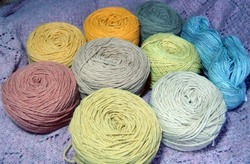 There are these lovely naturally dyed yarns from Freshisle Fibers . She uses black walnuts her father has collected, coreopsis, marigolds, Queen Anne's Lace, all sorts of mordants, etc to arrive at her colors. And the Suffolk sheep, being a down breed, do not felt, so the socks and garments knit from it are machine washable. I made some socks from her watermelon self-striping yarn, and they are the warmest socks I own! 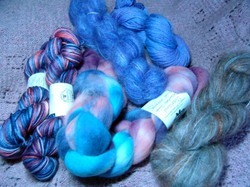 I have added to my stash of Spunky Eclectic (not Electric) fibers, both yarns and rovings. I picked up my Spunky Club while I was at her place, to save her on shipping and to get it a bit early. Now I can show it, since she has mailed it. I picked up some worsted weight yarns and some mohair she dyed with which to make mittens. I can't show you all of that, since DD has taken to making the mittens for me, and hasn't returned them yet. And lastly, I just received these braided rovings from The Yarn Wench in colors that caught my eye while not being my usual colorways..... I think there is some relaxing spinning in my future between hers and Amy's rovings to take away some stress of Christmas! I know - these are a stretch, but hey - it's Christmas time and I'm behind in the ABC Along! 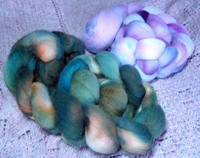 Besides, they go along with my rare/exotic spinning fibers project. The Valais Blacknose is a coarsewooled Swiss sheep kept primarily for meat. Its wool is considered to be a carpet wool. 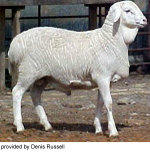 Van Rooy is a meat sheep from S. Africa engineered by a senator to be strong and drought hardy, & have a high fertility/production percentage. Vendeen is a French sheep breed. Its wool is used for hand-knitting wools and high quality fabrics such as hosiery, dress fabrics and flannel. 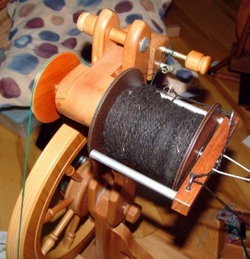 In my cruising of the Internet seeking out rare and exotic fibers to spin, I can't say that I have found any sources for any of these fibers, but their names are victoriously starting with "V"! "U" is for "Uberhelpful Award"
Once in a while, someone comes along at just the right moment and says just the right thing, or does the right thing and it makes all the difference. I was at a difficult point with my eBay purchase Rose this fall. I simply could NOT spin slowly on it, and therefore could NOT make a bulky single on her. I almost parted company with her out of frustration, seeking a single wheel that would do it all. I tried changing drive bands. That is when I discovered splicing poly bands was more difficult than it sounded. I also could not keep the drive band on the largest whorl. In corresponding with a possible buyer for the Rose, I decided I did not want to part with her, and backed out. The wonderful potential buyer was very gracious about my change of heart, and mentioned Tracy Eichheim who has been selling Majacraft wheels longer than the current company owner has owned the firm. Tracy helped me figure out a number of problems about how she was set up. As a consequence, I not only have her working better than when I bought her (she was six years old, but never spun on when I received her), but I purchased accessories through Tracy. So now I have a lace flyer and fat core bobbins, a Wild Flyer and bobbin, and a plying head and bobbin, courtesy of Tracy and the wonderful people at Majacraft who sent me the accessories directly, saving me shipping. And Tracy gets my vote for this year's most "Uberhelpful Award." And to sweeten the interaction, I got this also. While perusing Tracy & Jean's website, I found a page of finished items. 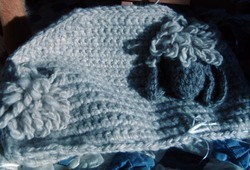 And so, I ordered a sheepy tea cosy to go with my sheep teapot.... just in time for the really cold weather that hit this week up here in Maine! Stephen King is from Bangor, Maine. He used to teach in the English Department at the University of Maine in Orono. He has had a number of homes in the area as his finances changed, but the one most known is close to downtown Bangor. He has wonderful wrought iron fence surrounding the property, in part for security. 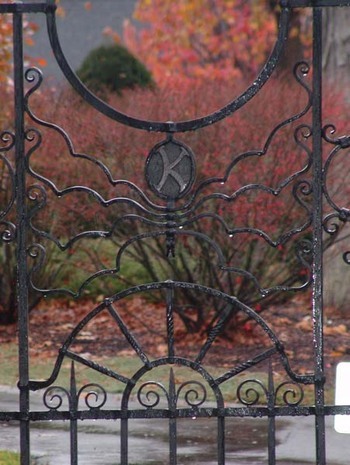 The gates have spider webs on the lower section, and the numbers on the front gate and the letters on the side gate are the heads of spiders, with larger circles of wrought iron forming the bodies of the spiders. On the gate posts are three headed dragons on one gate, and bats on the other gate. Mr. King spends a lot of time in more sub-tropical climates since his accident a few years back. He enjoys being a regular citizen here in Bangor, and for the most part, the locals let him be, without asking for autographs, or photographing him doing his business, etc. His house, even if not occupied year round, is a local landmark. Many of Mr. King's stories are set around the region, and for officionados of his works, like my DS the eldest, the places are recognizable. There is even a bookstore downtown that sort of specializes in Mr. King's work, rare editions, signed copies, etc. Yes, "R" is for relatives, but no, I won't inundate you with photos of all my relatives, or even just the weird ones. 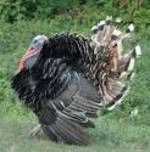 It is coming up on the season to need weird relative repellant, however! This is one of my offspring - the recent groom the weekend he got married. 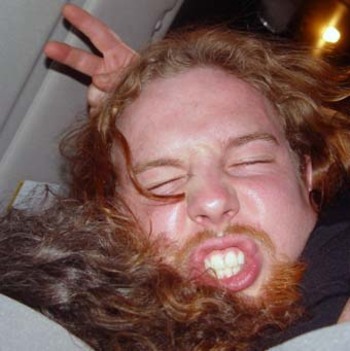 Yes, the Viking red beard is his natural beard color. I have relatives in nine states, and that is without living parents. Maine, North Carolina, California, Montana, Alaska, Michigan, Maryland, Colorado and Georgia. How many states are your relatives in? I had joined a sock knitter's Yahoo group. I'd mentioned I wanted to learn to do two socks on two circs, and one of the readers E-mailed me a link to Queen Kahuna. I ordered her book, since that was a challenge I'd given myself, and the rest is history. The first pair probably took me six weeks with distractions of life, working 60-80 hours/week, single parenthood, etc etc etc. I also frogged the beginning several times as I figured out the size me future DIL required. She received that first pair of Kahunas. The rest is history. I've put out a pair of Kahunas in as few as four days now. My feet have a chance of being warm this year in the Maine winters. And I've even taught the Queen Kahuna method of knitting socks - I include a copy of Mary Anne Beattie's book with the class fee.